The current anti-migrant campaign is not simply a matter of an economic nature, it is essentially a political interest. A group is taking advantage of the nationalistic sentiment that remains here and in other parts of the world. Clearly there is unrest because of unemployment and low wages, just as in Germany before Hitler people were discontent about inflation. But to blame these misfortunes on certain social or cultural, national of foreign groups, has an obvious political connotation. Donald Trump and his advisors have gained from stirring up members in certain sectors of U.S. society against immigrants and, particularly, those of Mexican nationality. The discourse of hate and the viciousness against foreigners enabled them to win the presidency and they assume they are going to remain and be re-elected to government by feeding the hatred of some groups against others. We must not underestimate the capacity of those currently in the United States government; they are not stupid. Donald Trump’s belligerent speech follows a cold and calculated political strategy. The content, the technique and the propaganda used are inspired in the theory conceived in the 20th century regarding the defense of the “vital space” in face of supposedly external enemies and the glorification of superiority and patriotism. During the recent presidential campaign a mistake was made: to lose sight of the efficacy of a political strategy sustained in awakening hatred and nationalism. It was not considered important or people did not know how to counteract it. But there is still time to address the causes of the problem and lessen the damage, by beginning to acknowledge that this phobia against what is external is deeply ingrained. These smart though irresponsible neo fascist people now in power want to build walls in order to turn the United States into a huge ghetto and compare Mexicans in general, and our migrant countrymen, specifically, with the Jewish people who were stigmatized and persecuted in Hitler’s era. This is why, in light of such barbarity, we must not limit our actions to protests and denunciations in the international arena, but rather we must consider the task of information essential within the United States. It is here that we must stand up to the campaign of hatred and human rights violations. Particularly, we must entirely focus on those Americans of good will, and there are many, to make them see that they are being victims of manipulation and deceit. In other words, we must devote more time to Americans living in rural areas and small towns, the Americans that hold civic, moral and spiritual values and, nevertheless, live in hopelessness and are being poisoned with hate against migrant workers. Let us remember that Trump won in 2, 548 counties, while Hillary Clinton won only in 472, even though these represent 64 per cent of U.S. economic activity. But it is in the small counties where people most affected by the 2008 economic recession live. In those places they have not recovered the jobs lost in industry, where they hire mostly Anglo Saxons, while in the last few years new jobs have been created basically in the service sector in large metropolitan areas, where they hire more Latin American, Asian an Afro American workers. It is urgent to establish communication with the people most hurt by the economic recession. We must explain to them with solid arguments the cause of the crisis affecting them. We must make them realize that migrants are not to blame if they are unemployed or don’t have good salaries and wellbeing. The fault lies with bad governance that punishes those in the bottom rungs of society and the middle class and only benefits those at the top. We must explain that when the 2008 crisis hit, the government first sought to save financial institutions that were bankrupt. We must tell them about poor income distribution, because while they pay large amounts of taxes, the wealthy class pays very little. We must also tell them that the largest plants installed in Mexico belong to American investors or businessmen that export merchandise and their profits to the United States and leave very few jobs or taxes in our country; that many companies are automated so they can increase production without an intensive use of labor. So generating employment here does not solely depend on companies not leaving the United States but on many other factors. That is the case in Mexico, where despite all the talk about the success of the exports model, our economy has remained stagnant for more than three decades. The promotion of an economy for the elites does not translate into development or job creation. Trump often maintains that the United States buys more from Mexico than it sells, that there is a $60 billion dollar deficit. This is not entirely true because our exports contain a high percentage of U.S. capital, technology and inputs. In other words, if it were true that the North American Trade Agreement (NAFTA) only benefits Mexico, our economy would not remain stagnant nor would there be migration. In 1970, when Mexican exports represented only 7.8% of GDP, economic growth was 6.5%, while today, when exports amount to 35.3% of GDP, our economy grows only by 2.5%. Therefore, Mexico is not growing based on our openness to the United States, because although we export a high value, we also import the larger part of that value. We must let know Americans about these and other arguments. By wielding solid reasons we can convince the population affected by the crisis that without hate and rancor, it is possible to build better societies on both sides of the border, with the ideal of justice and universal brotherhood. Instead of hostility, what is most advisable for our people and nations is to have respect, mutual understanding and cooperation for development. With these thoughts in mind we call on American academicians and intellectuals who hold civic, social and democratic values to draw up a plan to see by which means we can convince and persuade workers and the middle class in the United States that migrants are not their enemies, but their brothers, admirable human beings who, just like the founders of this great nation, were forced to leave their places of origin out of need, not because they wanted to. We must counteract with fundamental principles Trump’s strategy and that of his advisors. Not with shouts and insults nor responding to their provocations, but with intelligence, wisdom and dignity, with non-violence. This is a battle we must undertake in the field of ideas. It is a struggle against those who foment selfishness and in defense of the forgotten ones. Our aim is for resentment to cease to grow in them against those who are not of the same class, nationality or religion. To the discourse of hate we must respond with the spiritual principle of love for others. Inciting hate against migrants is a way of attacking all humanity. We became human when we set out from our places of origin and started walking. Our ancestors, of all of us, left Africa, reached the Middle East and Europe, possibly even Mexico. It has been proven they settled in Asia and from there they populated the American Continent. Migration is the foundation of nations and this great country is an example. The force of modern cultures is in the sum of all influences, all languages, and all intelligence. Humans have walked a great deal and have populated nearly most of the world but we all come from one same home. Today we acknowledge our shared history through the universal value of brotherhood. That is why, when a wall is built to segregate people or when the word “foreigner” is used to insult, disparage and discriminate our fellow men, humanity, intelligence and history are being insulted. However, I am optimistic, I believe the wall and the demagoguery of chauvinism will not survive against the talent and dignity of the American people. I wager that with arguments, the strength of public opinion will manage to make those who, like Donald Trump, choose to use threat and force, come into reason. Here in the state of California, a blessed migrant refuge, we honor César Chávez, an exceptional social fighter, who taught us that freedom is not implored, it is conquered. Here, from Los Angeles, we want to express to all Mexicans on this side of the border our most sincere solidarity, an active, committed, impassioned and brotherly one. Coordinating work with academicians and social leaders to draw up a plan to serve as the starting point for the creation of committees in counties and the dissemination of the message of reason and fellowship among the U.S. population. We will transmit information in English and Spanish, using mass media and social networks. 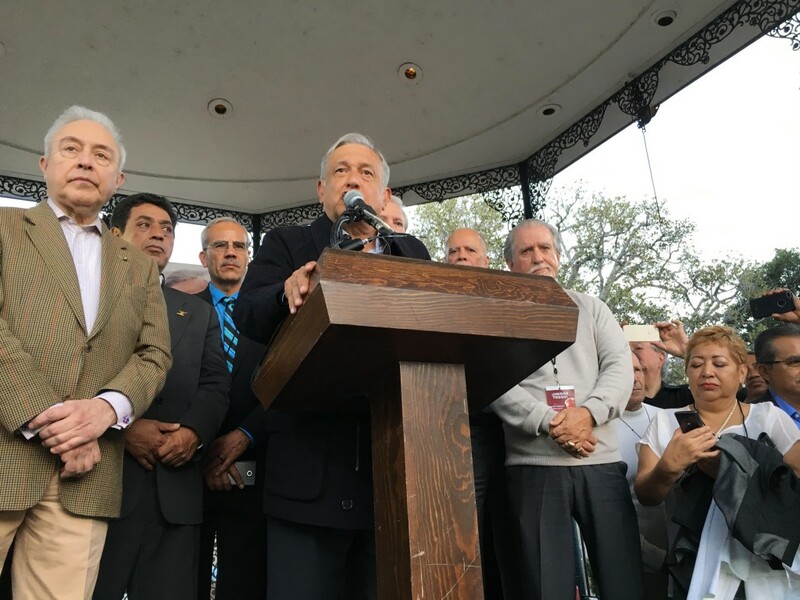 We will also publish a special edition of the Regeneración newspaper to be handed outside of churches, unions, stadiums, food stores, public spaces and shopping malls. The committee that represents us will bring together lawyers for the defense of migrants from Mexico and other parts of the world. We shall seek unity with other social, civic and migrant organizations in order to act jointly in the defense of human rights and against racial discrimination. The right to freedom from want. The right to freedom from fear. I want to thank each of you for being here in this famous Plaza Olvera of Los Angeles. Rest assured that we are working to confront hunger and poverty in our country so that in the not too distant future no one is forced to emigrate and people can find work where they were born, near their families, with their own traditions and culture. We are fighting against corruption, which is Mexico’s main problem and we have the strong conviction and the moral authority to completely eradicate it. At the same time, we will be closely watching so as to prevent mistreatment against migrants from Mexico and the rest of the world. Next week I g to Chicago and in the course of one month, I will be visiting seven cities in the United States. I am committed to returning to Los Angeles. We shall meet again. Neither the United States nor the American continent come first. What comes first is to build here on this earth the kingdom of justice and universal brotherhood.